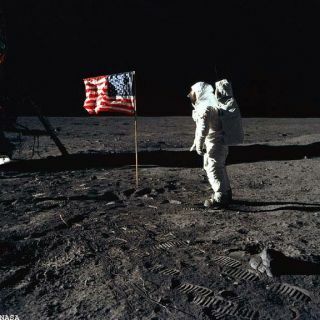 Astronaut Edwin E. "Buzz" Aldrin, Jr., lunar module pilot of the first lunar landing mission, is beside the U.S. flag during an Apollo 11 moon walk. The Lunar Module (LM) is on the left, and the footprints of the astronauts are clearly visible in the soil of the moon. Astronaut Neil A. Armstrong, commander, took this picture with a 70mm Hasselblad lunar surface camera. Thisstory was updated at 4:13 p.m. EDT. It has beenfour decades since people from Earth first landed on the moon, but it has alsobeen nearly that long since humans stopped going. In the three years that followed NASA?s historic July 20,1969 moon landing by Apollo 11 astronauts Neil Armstrong and Buzz Aldrin, fivemore missions successfullytouched down on the lunar surface. In all, 12 men walked on the moon duringthose flights, the last of them in 1972 during Apollo 17. Today, NASA is on apath to return to the moon by 2020, but some believe the goal of humanspaceflight should reach much farther - especially in the 40 years to come. Among themis Aldrin, who believes that humanity can surpassthe moon and reach the next stepping stone - Mars - by 2031, before thenext four decades are up, but only through an international effort by manycountries. The moon,Aldrin said, can be aspringboard for places beyond and a robust space presence in low Earthorbit. By working together to form an international base on the moon,individual spacefaring nations like the United States can free up more time forother projects like exploring asteroids, comets, the moons of Mars, and thenthe red planet itself. ?It?sleading toward global space leadership,? Aldrin said of an international pushto the moon, Mars and orbital stations. ?It promotes change and enlightenedcooperation.? Thatcooperation will be key, especially in 40 years when the amount of spacecraftand junk orbiting Earth will have most assuredly increased along with thenumber of humans and countries in space, Aldrin explained. ?We candisagree about human relations, piracy and secrecy, or land grabs below 100kilometers,? Aldrin told SPACE.com. ?But up above, it?s a differentstory. I think we can really challenge our diplomacy and our relations with therest of the world in that region.? PeterDiamandis, whose company Zero Gravity, Corp., offers weightless joyrides aboarda modified jet, believes that the nature ofspaceflight could change in the upcoming decades, but only through trueinnovation. "Firstof all, I think that we need to be looking at trying to change how spaceflightis implemented, because today I think it's ridiculous that spaceflight is asexpensive or more expensive than it was 40 years ago,? said Diamandis, whofounded the X Prize Foundation that is offering a $30 million Google Lunar XPrize to the first privately funded team to put a rover on the moon. ?We're nottrying new approaches. We're using effectively the same technology. Where istrue, really risky breakthrough work being done? I don't see it happening atNASA and I don't see it being tested. ?So I'dlove to see some true research and development in propulsion takingplace," Diamandis said. "I'd love to see private companies supportedto the maximum extent possible, for example, the COTS D program [a NASAprogram that can encourage commercial developmentof manned spacecraft for station flights ], where for me I think it's ano-brainer. For the cost, it is probably the most logical and most prudent movethat NASA could make to have a backup to programs which may ultimately not workor may ultimately get cancelled. Why not? ?I thinkthat we need to create real markets," he said. "We do live in acapitalist society, we have a free economy, and NASA should be practicingcapitalism and market economics to the maximum extent possible and leading theway." For planetaryscientist Alan Stern, a former NASA associate administrator for science,the year 2049 should bring routine commercial space travel, manned missions tonear-Earth asteroids and even Mars. By then, astronauts should be marking theApollo 11 moon landing anniversary from inside their own lunar researchoutposts, Stern said. But baseson Mars can be the precursor to grander flights since the technology requiredfor the endeavor can be reapplied to asteroids or more remote targets, he said. ?Therearen't serious technical barriers to go to Mars. That's not to say it's nothard, but we're already pioneering long duration human spaceflight with thespace station, which has now been inhabited for the better part of 10 years,which is much longer than a Mars journey,? Stern told SPACE.com. ?We're understanding what the logistical and repair needs are. We've had peoplein space a year at a time, and then when they land, they're out walking aroundthe streets a day or two later. They're not feeling entirely back 100 percentfor a long time, for weeks, but that shows you can send people on a year-longjourney to Mars. And if there are any health concerns, you can always thespacecraft if you have the money to do it and create artificial gravity. ?Radiationis a hazard, but you can, if you have the financial wherewithal, build ashelter inside the spacecraft for the occasional bad day event where you haveto hide out," Stern said. ?So all these things are tractable if someonewanted to cut the check, and invest, as a private investor, to send us to Marson a 10-year program, it's entirely within our technology today. Entirely.? CornellUniversity astronomer Steve Squyres is alreadyon Mars, at least robotically via NASA?s Spirit and Opportunity rovers,which he has been overseeing as principal rover scientist. But the next 40years, he said, carry the promise of a permanent human settlement on acompletely different planet. ?Where Ihope and think we'll be is that we will have gone back to the moon in order toprove out the technologies and techniques that we need to venture further outin the solar system,? Squyres said in an interview. ?We will have conducted thefirst human missions to near-Earth asteroids, and we'll be in the process ofusing the first permanent, scientific base onthe surface of Mars. That's what I'd like to see and expect to see." That is notto say that there are hurdles. Squyres said there is still a barrier of willthat humanity must overcome before reaching the red planet in person. ?There arenew launch vehicles that have to be created and built and tested,? he said. ?There are new spacecraft that have to be designed, but there are no technicalmiracles standing in our way. All we've got to do is decide we want to doit." Writer-producerAnn Druyan, widow of the famed astronomer Carl Sagan, may be in a minorityamong those pressing for humanity?s expansion out into the cosmos. The peopleof Earth, Druyanbelieves, may need the next four decades to mature before setting up shopon other worlds. ?Well, I'mnot a big fan of human colonization,? Druyan told SPACE.com. ?Just interms of the kinds of horrendous crimes that we've committed in the past. Andso part of me feels that before we start actually moving into some of theseother worlds, we should be working on our citizenship skills. And our abilityto feed each other, and some of the other things we have to figure out how todo on this planet. ?But Iwould love an exploratory mission to Titan, which to me has one of the mostalluring planetary surfaces that I've yet to see," she said. "Ofcourse there will be all kinds of revelations coming from Kepler, and us beingable to get up to speed on visiting some of these other worlds is a big thingI'd love to happen. ?We do notknow definitively what the case is on Mars. Really, what the situation is.There's been tantalizing evidence here and there, and I think that certainlybears much further investigation as soon as possible," Druyan said. ?Thesemissions are the things that people like to say, well what about hunger? I justdon't see them as necessarily being antithetical to each other," she said. "In fact I think they feed us in different ways. But also, the money necessaryto do this kind of exploration, when compared with the defense budget, isreally not even a significant fraction. So I think getting our house in orderhas to go hand in hand with a much more exciting and vigorous program ofexploration.? SPACE.comSenior Editor Tariq Malik, Senior Writer Andrea Thompson and Staff Writer ClaraMoskowitz contributed to this report from New York City. This story was updatedto reflect the correct date of the Apollo 11 moon landing.